United Party for National Development (UPND) leader Hakainde Hichilema has condemned the attack on National Democratic Congress (NDC) members by PF thugs in Lusaka today. 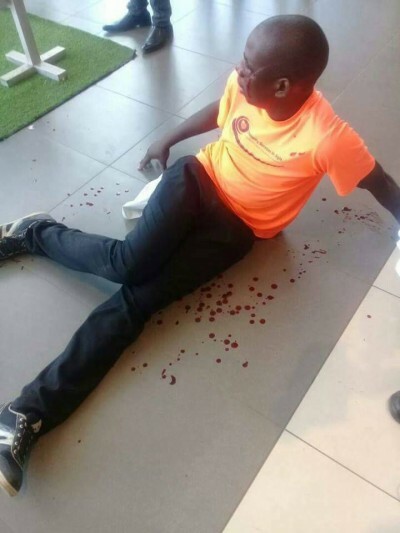 We would like to condemn in the strongest terms the violent attacks by known Patriotic Front cadres on the members of the National Democratic Congress (NDC) in Lusaka this morning. Our country has already experienced enough bloodshed and we cannot continue witnessing such behaviour in full view of the police. Violence must not have room in our country’s governance and as such all well-meaning Zambians must condemn the PF for these uncivilised politics that they continue to practice. We sympathise with the NDC members who were hacked this morning and we would like to encourage the Roan Member of Parliament, Hon. Dr Chishimba Kambwili to remain strong even amidst such inhuman treatment. We call on the country to join hands and end politics of violence and this must be done by telling PF leaders to stop violence with immediate effect. This violence is coming from the top PF office, this is why there is impunity which has never been seen before. Our country needs issue-based politics and not intimidation by those who claim to be in charge of our nation. This country has no one in control, people are surviving by the grace of God. If there was someone in charge, people would not be killed and maimed in broad daylight by fellow citizens. If there was ever a time for the police to rise above partisan politics, it is now. The Police must not fall prey to abuse by greedy politicians who want to settle personal political scores. We have for a long time now been stating that the PF has no plan for our country other than violence, corruption and dictatorship and now we are being vindicated. This is the police that will charge a victim and not the perpetrators of these heinous crimes. This has happened to NDC members. This is our pledge as UPND. We will run a government based on the true tenets of democracy. This means that violence will have no place in our country. When people have no idea what to do, they create confusion in order to be seen to be doing something about it. This is the oldest trick in the politics manual. The country needs healing but typical of the PF leaders, they keep dragging our country backwards, this must be stopped forthwith. We should move on to civilisation once and for all.